If you’ve been reading my blog for any length of time, you’ll already have guessed that this kind of advice is useless at best and helps no one. This is also the reason why I spend approximately 5 minutes on colour theory in my Specify Colour with Confidence courses. Because having a thorough understanding of the colour wheel does not give you the proper tools and knowledge to choose colours for hard finishes, fabrics or paint for your house or your clients home. I have NEVER and I mean NEVER consulted a primary colour wheel to choose a paint colour or countertop or fill-in-the-blank-here. My colour wheel shows you where the neutrals fall inside the conventional colour wheel, along with guidelines for coordinating them which is way more useful. A transparent stain (without any colour) will last maybe two years. A semi-transparent stain lasts 2-3 years. And then when you don’t maintain that and your fence gets discoloured, you might get a solid stain which lasts 5 years if it’s an alkyd (oil based) and 3 years if it’s a latex. Then, when that is also not long enough, you’ll eventually paint (this is the same for stained beams on the exterior of your house too, by the way). My Mom went out and unknowingly (and with obvious bad advice from the paint store) ended up with a ‘solid stain’ to paint her brand new deck for the first time. Within two years it has chipped badly and looks terrible. Had she simply stained her deck with a semi-transparent stain, it would have faded instead of chipping (obviously the wear on a deck where people are walking is much higher than it would be on a fence). Now she is considering installing PVC decking because you can’t go back to transparent stain if you have used a solid stain unless you strip the entire deck. And because you can’t change the colour of PVC, it’s really important to get the colour right the first time. A lot of people choose to leave their fence ‘unstained’ for this reason. Because if you don’t maintain the stain, it starts to fade (which is fine) but then the bare wood weathers to a green grey (below) and then you’ll have orange bits in other places–which is not so attractive. My backyard fence with espalier apple trees growing along the fence (It would get really hard to maintain this every two years). My white garden gate and vinyl decorative fencing, also matches the white trim on our house (below). You can see the backyard fence I was just showing you behind the gate (above). Maria’s house with white trim. This house has a pretty contemporary fence on one side, stained brown probably because of the tuscan brown trend as it actually does not relate to their white house with the black roof, at all. Here again (below), the fence is weathered and appears to be unstained. I do like how it relates to the hardwood inside the house. If you are going to paint or stain your fence (and not leave it to weather like I did) then this seems obvious. This cream house looks great with the coordinating cream fence. DON’T just stain your fence orange if it in no way works with your house! I see this a lot. It’s meant to look like “natural” cedar, but does it ever really? Most often you just end up with a strong orange fence that doesn’t relate to anything. DO invest in a landscaping plan! 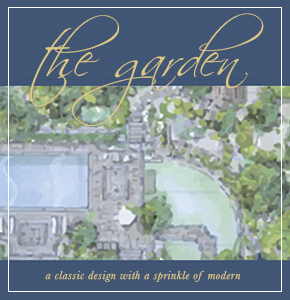 And just because I’m totally biased, I recommend my Garden Designer MaryAnne White, she lives in New York and we did it all long distance 5 years ago. Don’t get cheap on the design, it’s the most inexpensive piece of any garden, it’s all the materials and labour that add up fast! 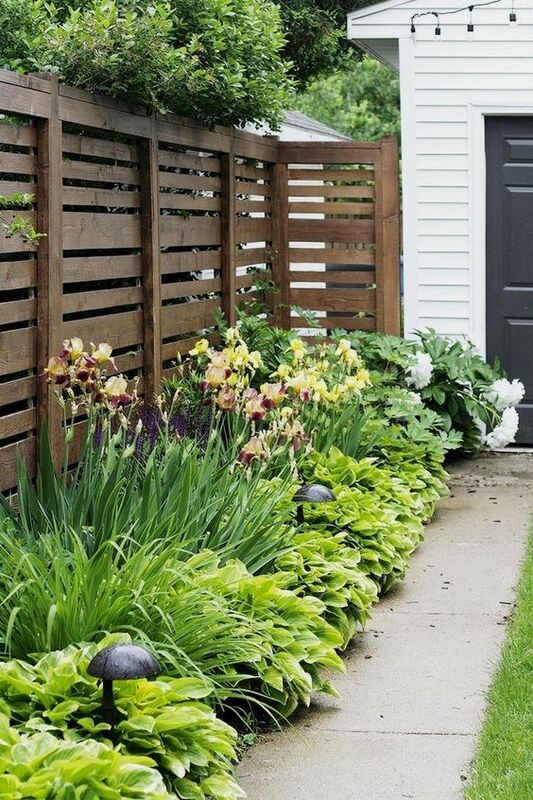 Or this beautiful combination with hostas if you have a shady backyard. Here, you can see that the deck has weathered to a green grey and the fence has been freshly stained (below). Probably leaving it the weathered grey would have been better since it in no way relates to the blue and white house. Again, don’t forget about landscaping. A lot of people spend way too much money on stone and other unnecessary design elements to make their exterior look more ‘interesting’. Landscaping is what gives the exterior of your home a look and a feel. Kind of like when you add lamps and accessories inside your home, that’s when it really feels like home and a place where you want to hang out! DO go for an elegant solution like continuing your fence with the same surface material as your exterior. You can see the fence on the bottom right of this photo, it’s gorgeous because matches the house. DO consider planting a green hedge, this way you don’t have to maintain a fence! I just had two fence posts replaced along the side of my backyard and it cost $850 for the materials and labour. However, opposite my house in the backyard, I have 16 foot cedar hedges (below). 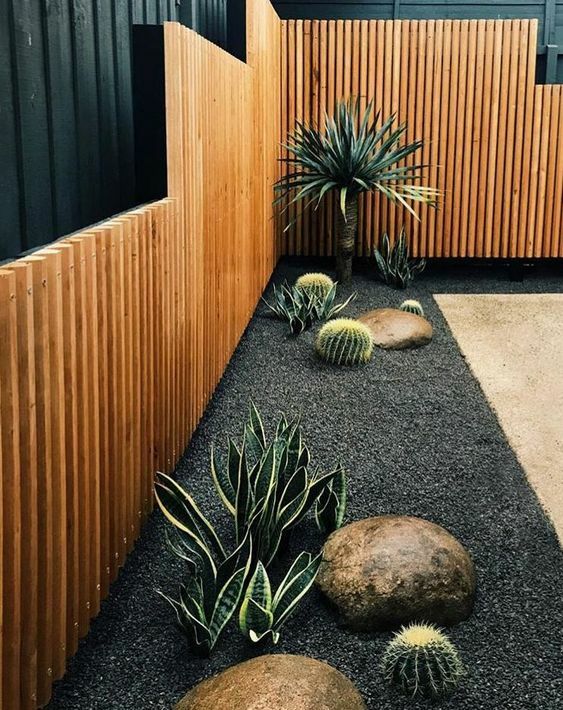 I love the green wall and the way it creates privacy so much, frankly, if this backyard had simply been a row of 8 ft fencing where I’m looking at two of my neighbours houses, I don’t think I would have bought it. I know every climate can’t withstand cedar hedges but where you can, you can buy them up to 10 ft installed! 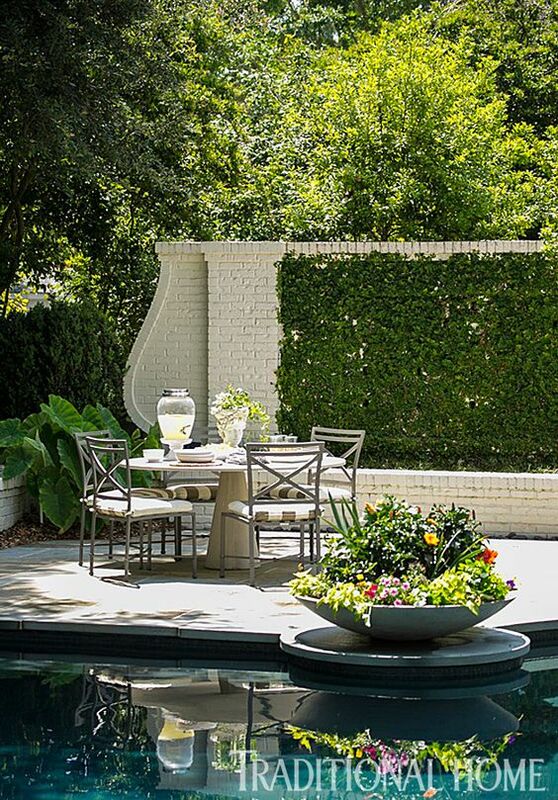 Love the combination of painted brick and trellis hedging (below). I do love how it looks against green however! Kelly green, black and white looks amazing! I do love this combination (below). Hopefully it’s in a yard attached to a contemporary looking house that repeats the black and wood. Don’t do this if you have a traditional house with white trim. I’m noticing a lot of orange stained wood (not in backyard fences necessarily) in interior design lately, wood tones are warming up, remember you heard it here first! Over to you my lovelies, please tell me, what colour is your fence? And then, share about the maintenance, and whether you agree with me on just leaving it a lovely, neutral, easy-to-maintain, weathered grey, haha. If you need help choosing a colour for your fence, check out our eDesign services here. Rules are for Amateurs, Exceptions are for Professionals; Yay or Nay? This is a very timely post for me. My husband and I were just discussing a fence that would run alongside part of our 2 acres to establish a division line between the yard and the woods. Our house (pink beige siding determined by Maria and Tricia) is trimmed with white but has black shutters. We have white porch posts and our wood deck and railing is a natural wood stain (OneTime Wood, highly recommend it!). 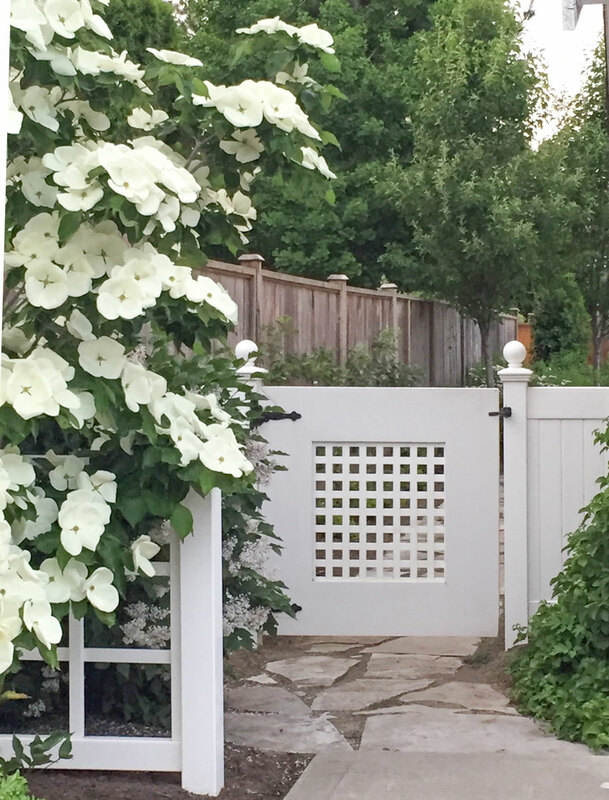 I think I would opt for black aluminum or vinyl fencing because white would likely need frequent washing to look nice especially where we live. Eventually I would like to do white vinyl deck railing though, but the problem would be deciding on 1.) decking color and 2.) shed color which we would also like to do eventually. I probably will consult Maria for both of these decisions if that is a possibility. We have a painted black wrought iron fence, which matches the traditional style of our home, as well as the black windows (windows are black on the outside, white on the inside). We are in a brick townhouse downtown, so the small planting beds of boxwood and hydrangea show through the fence. In a previous home we had a cedar privacy fence that was stained “cape cod gray”, and it looked so good with our cape cod style home. Then a new POA board came in and changed the fence colors to dark brown (one choice of stain). I was so sad to have to cover our fence. Most houses looked bad with the dark brown, and they didn’t really even match each other. I was glad to leave that neighborhood. Interesting! I never thought much about relating one’s wooden fence to the house apart from the obvious NO’s of seeing a very orange glaring fence from time to time. Stone walls, yes! I notice when those are unrelated to the home. Wood fence? I’m with you on letting them just age naturally. It looks lovely. 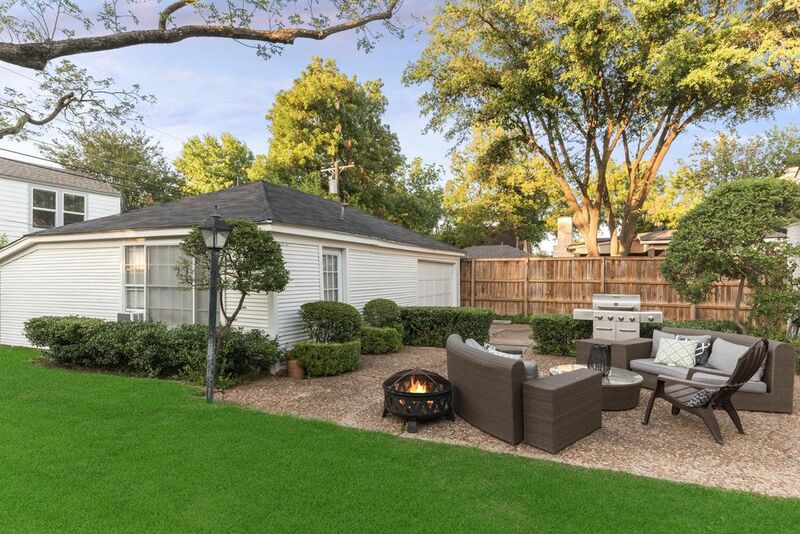 I don’t mind that example where one side of the fence is stained brown because it simply looks like tree trunk color, which fits the outside location- I wouldn’t expect it to be matched to the black and white house. Our home (which is on a little mountain on 2 acres) has 10′ hedges around two sides of the property near the house and I LOVE them. They completely hide the chain link fence, and the other two legs of the fence are far from the house and don’t bother me much. Now you’ve got me thinking about exterior paint colors though! Our hedges bloom with orange trumpet flowers for much of the year, and we have lots of orangey natural rock around the acreage as low walls and set in the slopes to lessen erosion. I use terracotta in my decorating so there is a harmony between inside and out. However our exterior is a light gray-green with denim blue trim and needs repainting soon. I’m planning to keep the body color and change the trim to a mid tone sage which I think will suit the mountain location and harmonize with nature. The roof, believe it or not, is impossible to see because the placement of the house at the top of the hill and close to the hedge on one side makes it so there is no curb appeal type view and you barely can even see the house until you’re right on top of it, either too close or too low to see the roof! I don’t even know for sure what color the roof is. Anyway that is getting replaced too but we will choose something pale to reduce air conditioning costs. Nice that your roof color can be ignored. That is so often another element that has to be considered in the whole outside design! Great timing! Not because I’m painting my fence but because I’m trying to choose stain for our dining room table that I’m sanding down. We have pale oak and hale navy walls with a Silestone Lusso counter nearby. We have a beautiful painting of our original family homestead above the table and it has a weathered cedar frame. Now I’m thinking I could stain the table with something to relate to that as I’m happy how it looks with the paint and counters. Thank you for your blog, it’s the only one I read regularly. My husband is a painter and I’ve been trying to persuade him to sign up for your course! This is very helpful. We won’t have a fence but wouldn’t the same ideas apply to decks and a screened porch floor? We’re planning to use artificial decking and it’s hard to find something that relates but doesn’t look like a bad attempt to match the SW Intellectual Gray shake siding. I’ve thought about a brown that relates to the hardwoods inside. Any suggestions? I personally don’t like fences . Prefer green belt areas and love where you use plants as your fence. In kitchens / fencing and here in Billings wood accents on the exteriors …. and how people always end up painting the wood cabinets or want to end up painting them down the road …probably the same for the wood fences..
I’m wondering if time of year aka temperature was an issue for your mom’s fence, since solid stain shouldn’t chip if applied within the temperature range on the can, and if the surface isn’t covered with dirt. That’s a point of using it instead of paint, since paint can chip over time and stain soaks in. Solid stain on clients’ and my house has just faded – and sometimes not for 10+ years, oddly enough. 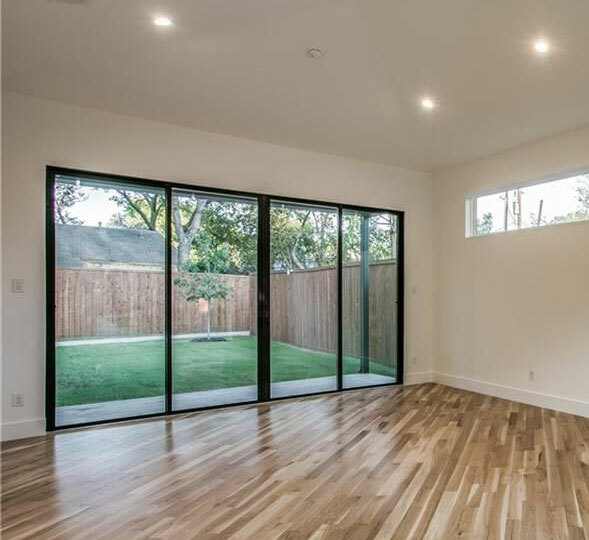 Semi-transparent can’t be used too many times, unless sanding to bare wood or almost bare wood, which is too expensive for the average bear. I used to go to [too many] seminars for painters, and had manufacturer painter reps to call, in order to help my clients know what to ask and how to spot red flags when interviewing painters – since so many painters are just brush-n-bucket guys. (I gave them a typed list.) So being a product nerd kind of happened. Just my take – YMMV. My wood fence went from a brick red to black. I wanted the fence to ‘disappear’. It matches my neighbor’s fencing who has a black aluminum fence. I like the look and have received numerous compliments. Happy that I spent the time to paint it. Regarding your Mothers deck…you can have a deck sanded like an interior wood floor. Home Depot rents the sanders. My husband has done it. Most difficult part is lifting the machine. 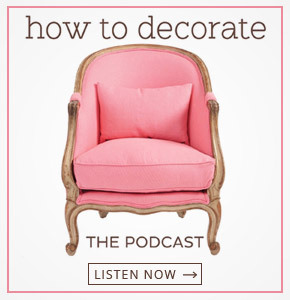 I’m sure it is more difficult with a solid stain than a semi solid but it does bring it back to “new”. Much easier than stripping I think. Great post. I see a lot of unattractive redwood stains on community fences as well as orange “cedar”. I would pick a hedge over a fence. Fences either gets weathered, paint chipped or are labour intensive. They lean or fall over in the wind and with age. On the other hand, a hedge needs pruning every two years. It’s quick & done! It makes a nice backdrop for your garden and will never have to be replaced in your lifetime. It coordinates with any house colour or design. 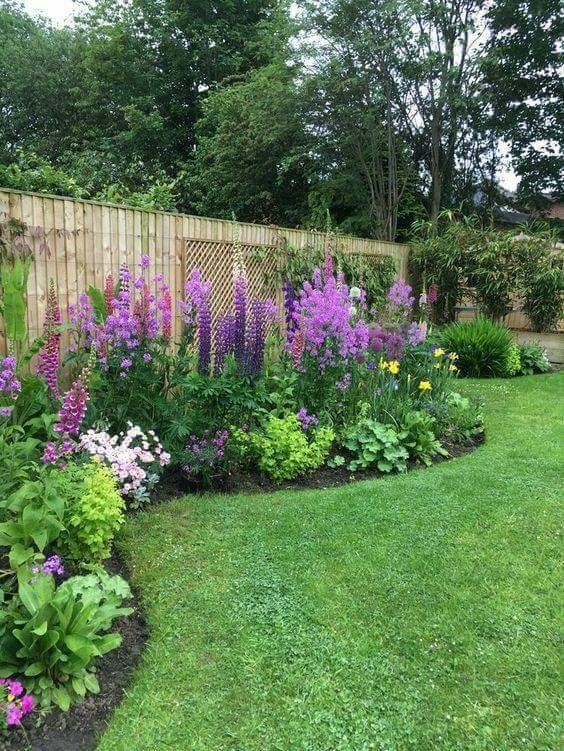 A fence looks good for the first couple of years were a hedge only gets better – fuller & taller. A fence makes gives you the feeling of being closed in like a prison but a hedge feels like a secret garden. If I had to have a fence, I would opt for a wrought iron one and have plantings along the inside to soften it. Great post Maria! 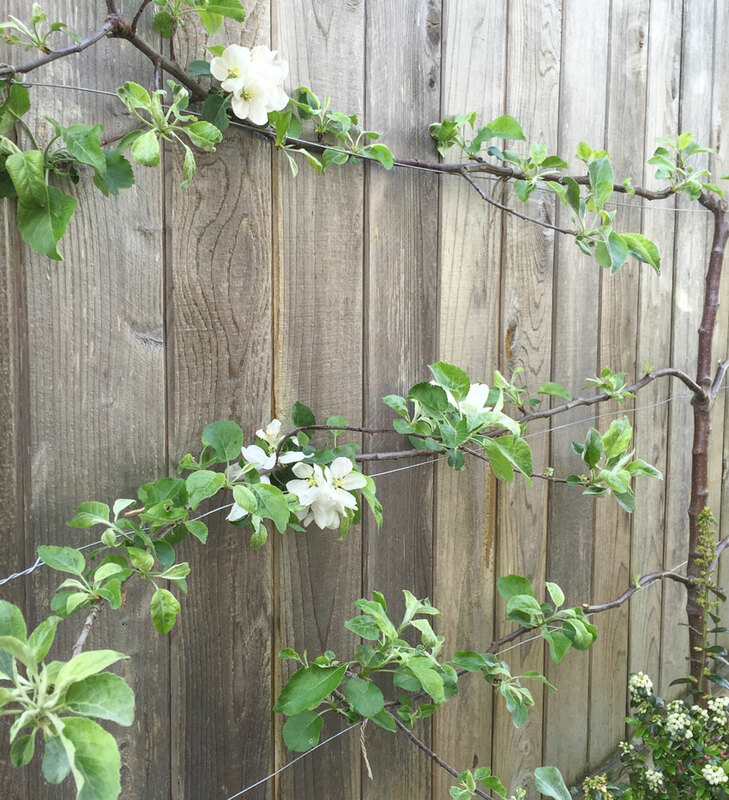 I wonder if my neighbor would let me grow espalier apple trees along his privacy fence that faces my driveway and street front! Those are so beautiful! We are looking to downsize our home, so this is bringing us to smaller lots, and many have fences for privacy. Sound familiar to anyone? White vinyl 6’ fences leave me wondering…what is so terrible in this neighborhood that needs this??! While the excessive white vinyl relates to the house, it’s just too much. Pass on that listing. We replaced the original redwood deck with a PVC one a couple years. We are on a hill overlooking a bay and facing south/east, we have sun on the deck all day, everyday. It is low maintenance but it reflects light like crazy. I didn’t anticipate that so I’m working on outdoor rugs in the seating areas. We have a lighter color (green/grey), not sure if the glare is similar with darker colors. Just something for your mom to consider. Wonderful timing with this post. What about the large 8’x8′ orangey-cedar columns in entryway or porch? Should they be color of house? (which in my case is white) Or should they match the fence? Which now I think will be aged to a natural grey. As always Maria, Thank You! This post is so timely! We hired a landscape designer for our front yard and the plan includes a short fence along the perimeter of the entryway to keep our dog from running after people. Our house has a gray roof, siding and brick (to be painted trim color). She specified a black iron fence (simple not ornate) because we have one alongside our backyard but also because it’s less maintenance and you can see through it. This is a seating area as well. I am wondering if it should be white or weathered wood? But then also don’t want to incorporate a new material we don’t have in the back. The wrought iron railing on the steps to our house is painted a beautiful dark gray that gleams in the light and looks much better than black with the gray elements on and around our house. It was one of the options from the local supplier—you might want to see whether you can get something similar. Some landscapes have the concern of color/size. Bright white fences, jump forward, create their own focal point & make a garden feel smaller, darker fences, recede & make a space feel larger. Know what you’re aiming for at the front end !! Also, beware a fence using a property line for location, merely because ‘it is there’. Especially in the front yard. Exterior colors change across continents & longitude/latitude & soil composition. A blue you love in Provence may not work for you in Abilene. In addition to stain/paint for fences, exterior wood decks/fences, USA, rot much faster since EPA rules removed toxic preservatives used for decades. If you’re used to stain/paint/wood, from experience, lasting a certain amount of time, that ‘time’ has now sped up. Significantly. Been disappointed in faux wood decks. Have not seen one that does not fade over time. Most stink in summer heat. Many are installed improperly and expand at joints, cupping upward, a mess, southeastern USA. Plastic or composite decking also tends to get super hot in the summer sun and becomes impassable for bare feet. Go with an ipe or mahogany, and oil or let it weather naturally. Maria with regards to your Mothers Deck have you thought about unscrewing the boards and turning them over, we did this at our sailing club a couple of years ago and it was very successful. Maria you always have such inspirational posts! I get so much out of them! Here in California our fences are usually shared fences because it gets costly plus because our houses are close together for the most part (tract homes) usually two different fences are never back to back. That all being said a lot of people select slump stone which is a pink beige and never seems to need maintenance. We have a pool and by law has to be 8 ft.high. Because we are on a hill and have a beautiful mountain view the previous owner put wrought iron on top of the stone to keep the view. That now needs to be painted so I am trying to decide if we should keep it black, which doesn’t relate or paint it dark brown. Black does kinda fade away however. I love our pots with colorful flowers and greenery and the pots are brown so maybe brown? Undecided. Love your yard and fencing and it definitely does relate. Also love the painted brick but wonder how long that will last. Have a wonderful trip time Fiji! 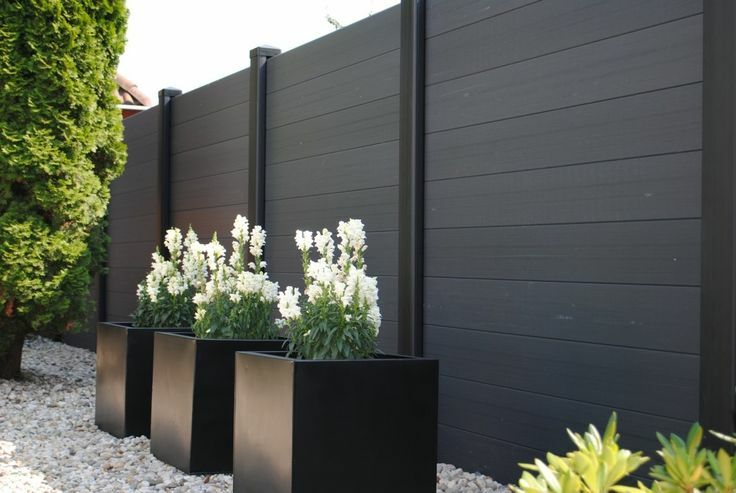 As most our homes have had open in-ground swimming pools (not separately fenced) I have always opted for the installation of black fencing as well as gates for the lot itself. 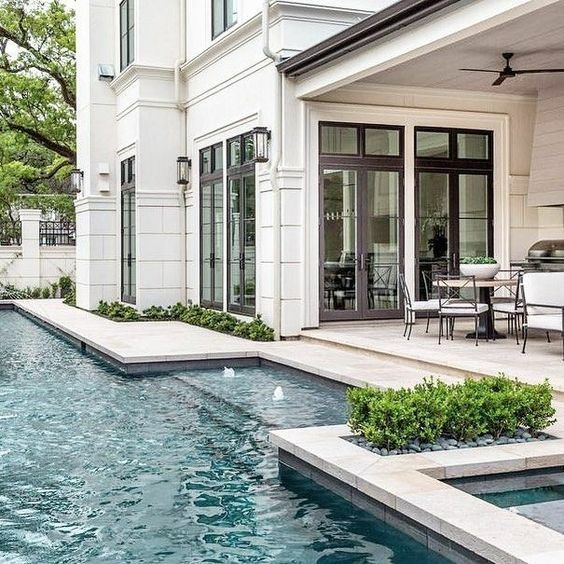 Reason; namely because it gives the illusion of no fencing and/or which can be easily camouflaged with greenery offering privacy as well as air flow. i.e. : Hedges, creeping vines. Also have found there are more options of required by-law height. i.e. : Vinyl coated chain-link that requires no maintenance or specialty coated decorative wrought iron. Great article. It looks like your hedge is Thuja occidentalis. ‘Emerald Green’ which isn’t really a cedar (Cedrus) – most people just refer to the hedge as arborvite. In a smaller yard, they work great, but I prefer a mixed border of conifers, maples, shrubs if you have the room (15′ to 20′). If you get a solid stain of good quality, it will last about 10 to 15 years, depending on the weather conditions – it’s what we put on our house now after years of applying semi-transparent stain over our cedar siding every 5 year. We did put on a composite deck and after a few years it faded from a rich redwood color to a light reddish tan. These decks need scrubbing yearly to remove mold (even though it’s south facing). Wood and the composite wood all take maintenance. Thanks for bringing up this subject as it’s not one that I’ve seen addressed before. We bought our house many years ago with an existing chain link fence. For a long time we couldn’t afford to replace it, and eventually it became so interwoven with our plantings that taking it down would seriously affect our landscaping. Over the years I ignored its ugliness. Then I returned from seeing all the stone fences in the Cotswolds and was struck afresh by its hideousness. Plant more and more green to cover it up is my method. At least it’s not some in your face color. And it is not in the front. There we have a stacked stone retaining wall, much of it covered by low growing plants, that mildly bulges and caves in places. I love it. We put up a fence between our neighbors home and ours because we looked directly into their 3 car garage and red house, from our dining room. We have a large shaded lot with over 50 oak tress. Stained the fence with a dark brown solid stain. It melts into the color of the tree trunks. Also the house has a large dark brown roof with deep overhangs, so it blends with the house, even though the house is a medium brick. The trick was to make it disappear, and it was the best solution we could come up with. I’ve been in my house 7 summers now and I primarily share my neighbors fence backs. Everything was left the weathered grey which looks old and unfinished to me. I power washed initially and stained with semi-transparent twice now. I get 3-4 years of my stain and I’ve been very happy with the color. It will be a little more of a challenge the next time I stain because of some additional landscaping but it pulls the whole look together and makes it look complete. I also took into consideration the wear and tear on the fences considering I am unable to replace them and wanted to make sure they held up as long as possible. Hi Maria, this is a timely post for me as well. We have a horrid deck that was stained a semi-transparent orange several years ago. In some of the planks the wood has rotted, buckled and warped from rain and time. what would be the best fix for this? Obviously we don’t want to spend the money replacing all the wood on the entire deck, but if we replace the wood, it’s not going to match what we already have. Any suggestions? Thanks!